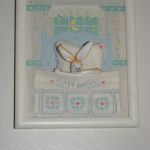 This entry was posted in other crafts, sewing and tagged crib, Guess How Much I Love You, nursery, wall stickers. Bookmark the permalink. 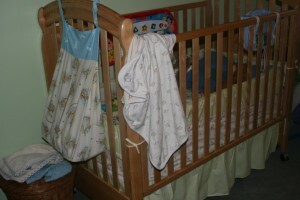 So I was searching Google for Guess How Much I Love You nursery stuff and I came across your blog. 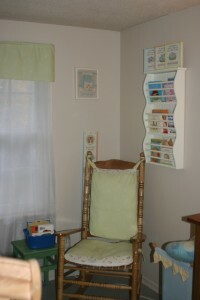 You did a great job with your son’s nursery! 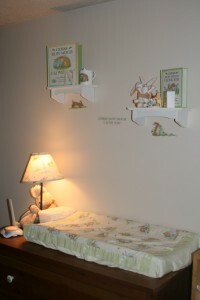 I hope I can have some luck in finding stuff for my baby’s room, too! I just lucked out. Not sure if the publishing company would be of any help now since it’s been a while since he found things for me. 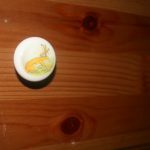 I found things on ebay, the dresser knobs. There is wallpaper out there but shipping to Canada was insane, if you’re in the states you might find something reasonable. I have seen pajamas. I also ordered some cross stitch patterns, from ebay I believe, and made my son a blanket, and a birth announcement (that still isn’t done and he’s almost 2!). As far as I know the fabric is out of print so you sort of just have to luck out and find something that’s kicking around out there. I have been researching the cost of a set for the guess how much i love you set. It is impossible to find them. I happen to find one at a resale shop at an awesome deal. Im guessing they would be some kind of collectore=s item but no one seems to know anything about the set. 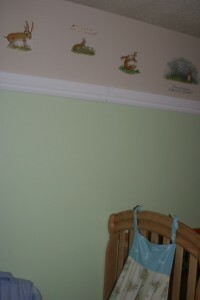 I have wall hangings crib sheet valances bumpber skirt the whole 9 yards and cant decide to sell it or keep it or even what price to put on it.